DISCLAIMER: I saw this in 2D. If you think A) 3D is the future of cinema and is the most magnificent thing ever and B), an adaptation of a book of this magnitude really needed 3D, I can only say this. The Great Gatsby may hold the title for the most tiring movie I have ever seen. Many times, it jumps around with no real aim I could understand, and when it does find a focus, you really can’t be bothered to care. But this isn’t a bad movie, per se, as it’s clear that those working on it were dedicated to what they were doing. I just wish what they were worth doing could honestly fill up 143 minutes. F. Scott Fitzgerald’s book is considered one of the best in 20th century American literature. I’m not familiar with it, but you shouldn’t have to be to watch a movie. 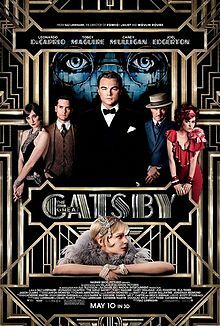 The story is told through the memories of Nick Carraway (TOBEY MAGUIRE), who is writing about a man he knew in 1922, a strange man named Jay Gatsby (LEONARDO DICAPRIO). 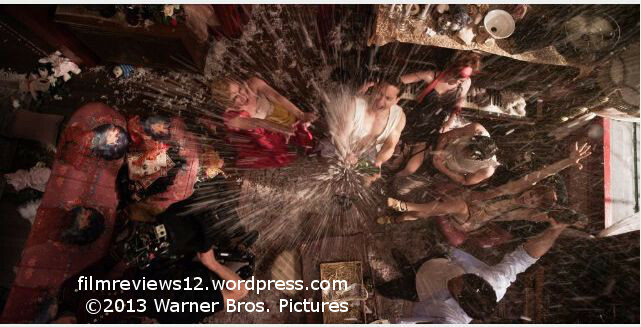 Every week, he throws a lavish party which brings nearly the collective population of New York City to his mansion. No one really knows about him, for he rarely opens up to anyone. But Nick is different. Through a maddeningly fast car ride into downtown New York, Gatsby recalls his life story, in away that he sounds almost as narcissistic as that Lights Camera Jackson kid. Anyway, members of Nick’s family are also around for this, especially his cousin Daisy (CAREY MULLIGAN) and her husband Tom (JOEL EDGERTON). Baz Luhrmann, who directed this movie, along with movies like Romeo + Juliet (which also featured DiCaprio in a prominent role) and Moulin Rouge, takes a big, bright kind of styling. I like that, but sometimes I felt it goes a little too over the top. Sometimes, when the character of Nick Carraway is writing his experiences, the words fly up from the page and appear either in the forms of handwriting or typewriting. This only reminded me of how a similar technique was used in one of the worst movies I’ve seen in my life. I dunno, that has nothing to do with my thoughts of this movie in the end, but I thought I’d point that out. A decision that a lot of people are divided on is the inclusion of music from rapper Jay-Z into the movie. The movie probably wouldn’t be that different with or without it – and the people that are completely turned off by this factor probably wouldn’t have enjoyed the movie if the modern music hadn’t been around. The acting is what you’d expect – these are talented actors working with a somewhat well written script. DiCaprio is convincing as the perhaps-slightly-insane multi-millionaire, and Maguire, during the wraparound scenes as a man in retrospect, does well in his role. Mulligan and Edgerton might not be as memorable, but there are no real lapses of talent. The Great Gatsby can be called little else than excessive – no one really wanted another movie about the book, since there has already been multiple. Even on its own merits, this can’t be called anything else than average. It’s a visual spectacle – but it’s long and forgettable as well. I think fifteen or twenty minutes could have been cut, to be honest. The decision on whether it’s worth your time and money is up to you. But it doesn’t need 3D. It really doesn’t.